NOTES: Short run kit with resin detail parts. The Société de Constructions Aéronautiques du Sud Est (SNCASE) took up residence in Marignane to manufacture seaplanes. But first of all, the bomber LéO 45 would be manufactured in Marignane (as in La Courneuve). The SE 200, a large six-engine seaplane designed by Lioré & Olivier (the company was integrated into SNCASE in 1936), made its maiden flight on 11 December 1942. Unfortunately for the SE 200, Latécoère was chosen for the transatlantic routes, and only 3 three SE 200s were manufactured. By 1942, about 1,000 people were working on the site, and the factory had to diversify into the field of metal constructions. It also developed the SE 700 autogiro, constructing 2 prototypes, though no more would be built. On 9 and 10 March 1944, the factory was bombed and partially destroyed. After World War II, SNCASE initiated two development programs that were subsequently discontinued though they did give rise to first flights in 1948. The first program produced the SE 1010, which was powered by four stratospheric engines and was designed for high-altitude photography. The second gave birth to the SE 1210, which was in fact a 1/3 scale flying demonstrator for the future SE 1200 – a 140 ton flying boat with a projected range of 10,000 km. But the seaplane era was over. In February 1949, SNCASE signed an exclusive licensing contract with De Havilland for the Vampire fighter in France. 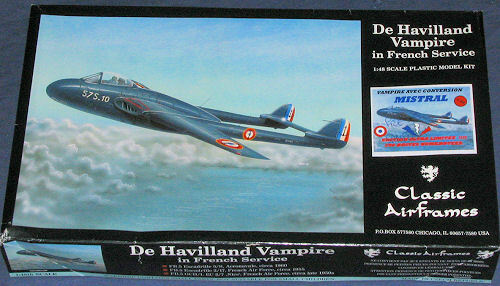 The French version of the Vampire was renamed the "Mistral". In all, 434 were manufactured, plus a further 90 of the naval version, called the "Aquilon". The assembly line continued to operate up to 1957. This was the first production jet built in France and examples served with many units, providing the sort of jet experience that was needed for those going on to F-84s, F-100s, and finally a long series of superb French designed aircraft. 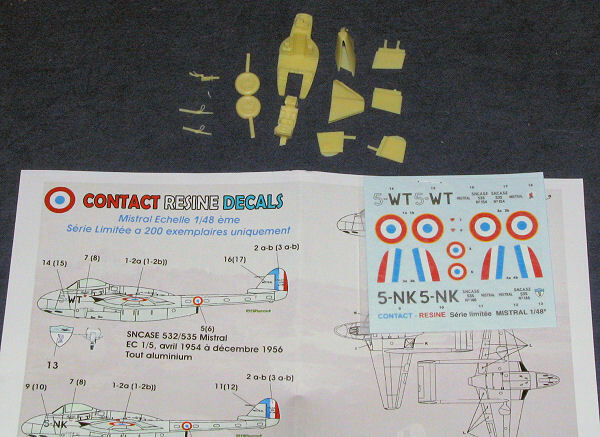 What you basically get here is the Classic Airframes Vampire kit with Contact-Resine supplying additional parts to bring it up to Mistral standards and a new decal sheet. The CA kit has been reviewed on several occasions and it is generally a pretty nice kit. The initial problems with misshapen intakes was somewhat taken care of in later boxings, but many state that the canopy is the wrong shape and the tail booms too thin. 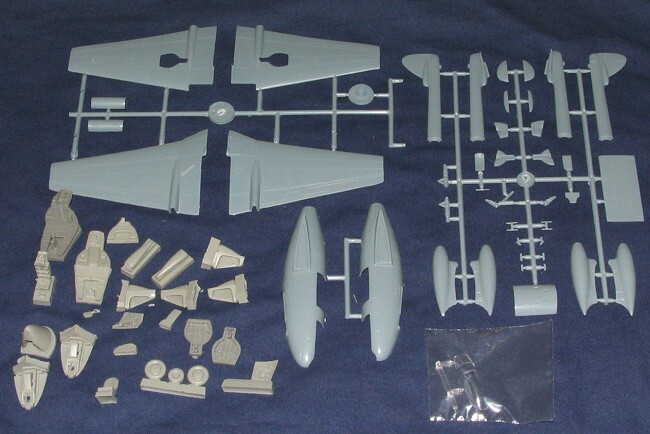 Regardless, it made into a nice looking model and allowed many of us to dump our grossly error-ridden Hobbycraft kits. Here is a link to the basic kit preview. What Contact-Resiné has done is to add those parts that make this a French-built Mistral as well as a few additional bits. Basically that means you get a proper cockpit tub, Ejection seat, and control stick for the interior. Naturally, you get the revised intakes that were only on the French Mistral. A new set of proper wheels is also included. Additional parts include a full flap set-up and actuating mechanisms for the outer gear doors. All of the CR designed resin parts are superbly cast. A new set of decals is also part of the package with markings for two overall aluminum aircraft from EC 5. These planes were painted with aluminum lacquer as the Vampire was a wooden aircraft. This is an excellent conversion set for what is generally a nice kit. Thanks to Contact-Resiné you are now able to model a proper French-built Mistral. One thing for sure, these kits will not last long as total production is limited to 200 examples. Each comes with a certificate of authenticity, making this more than just a fine kit, but also a collector's item. My thanks to the fine folks at Contact-Resiné for providing the review kit. You can only get yours by visiting their web site.